To a large extent, the history of the Earth’s dynamo-tectonic development is related to the origin of the oceanic water masses and their surface oscillations – characterized by the advances and retreats of epicontinental oceans. During major parts of post-Precambrian time, the present land surface was extensively covered by shallow seas, while today the continents are dryer than at any time during the last 570 million years (Phanerozoic). During the late Mesozoic, the continental flooding was nearly as widespread as that of the Lower-Middle Palaeozoic, though the highest sea-level may not have been higher than 200-400 metres above the present shore line (cf. Miller et al., 2005). “Today, a similar rise would inundate less than half the area that was flooded in the Cretaceous, because our continents stand high above the sea, whereas the Mesozoic lands were low and flat” (van Andel, 1985). The same low and flat continents were apparently the norm during the Palaeozoic as well as in Precambrian time; the elevation of our continents and continental mountain chains, as well as the mid-ocean ridges, seems to have a quite recent origin – having basically occurred during the last 5 million years of Earth history (cf. Storetvedt, 2015 for references and a compilation of evidence). For post-Precambrian time – ranging from 570 My to the Present, the stratigraphic record is generally well exposed due to the fact that epicontinental seas repeatedly covered substantial parts of the present land surface. Based on geological maps, depicting the distribution of shallow marine deposits, it is possible to evaluate the fluctuations of sea level with time. However, compared with younger geological periods, Cambrian stratigraphy is poorly known so, for these early times, eustatic correlations of sea level are rarely possible (Hallam, 1992). Nevertheless, since the late 19th century, a cogent picture has emerged that suggests that during post-Precambrian time, significant regions of the present continents have repeatedly been engulfed by longer term shallow seas, despite the fact that the present volume of marine surface water seemingly is larger now than ever before (cf. Storetvedt, 2003). Around the middle of the 19th century, it was commonly thought that the Earth had cooled and chemically differentiated from an original fluid magmatic state, and that seawater was a natural product of the planet’s primeval de-volatilization. In the view of the Austrian geologist Eduard Süss [1831-1914], the expelled water had originally spread across a fairly featureless crustal surface, but progressive cooling and planetary contraction had produced crustal warping and fracturing leading to redistribution of the surface water. Consistent with this view, Süss (1893) conceived of an early Precambrian Earth covered by a shallow pan- global ocean – an idea which Alfred Wegener later took for granted (Wegener, 1912 and 1924). 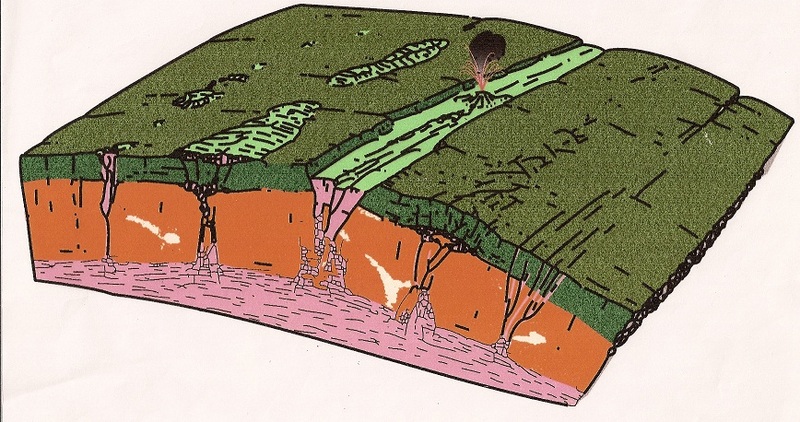 In Süss’ opinion, continental and oceanic crust were compositionally similar and interchangeable; he opined that during the presumed planetary contraction, large areas of the surface had collapsed to become deep sea depressions into which water masses previously residing within the continental crust had drained. The volume of surface water was considered to be constant, but it was well known that the sea level relative to the continents had displayed rhythmic variations: the sea advancing over low-lying lands – transgressions, had alternated with sea-level retreats – regressions, forming a pulsating global shore line succession for which Eduard Süss coined the term eustatic. His dynamic driving force was the Earth’s cooling and contraction. 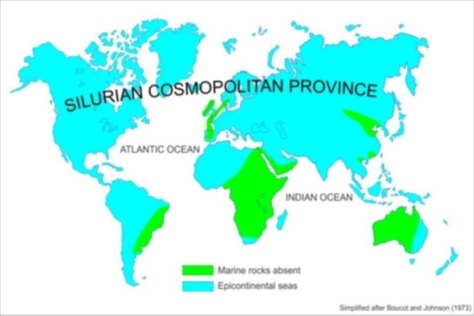 In the Süssian tectonic system, the oceans had been growing for a long time (i.e. an increasing part of the global crust had been down-warped by the forces of thermal contraction) at the expense of upstanding continents, thereby accounting for the geological fact that the land masses – with their extensive cover of ancient marine sediments – had been subjected to an overall progressive drying-up during postPrecambrian time. However, the common transgressive pulses were explained by a net reduction in storage capacity of the developing oceanic basins – attributed to the accumulation of transported terrigenous material from surrounding regions of the crust. Regressions, on the other hand, were ascribed to the increasing volume of the deep sea basins formed as a consequence of contraction. Thus, transgression and regressions were ascribed to different and seemingly independent causes – which therefore smacked of an ad hoc escape. Furthermore, the generally slow build-up of the transgressive phases, as compared to the much more rapid regressions, was an even greater problem for the Süssian theory. 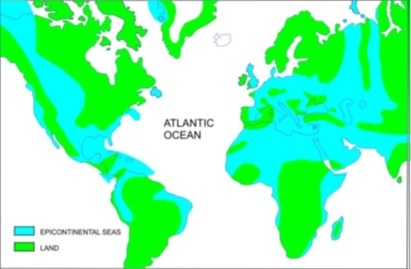 The distribution of land and sea in the Upper Palaeozoic, according to Eduard Süss, is shown in Figure 2. Süss postulated the Gondwana palaeo-continent – an ancient mega-continent that in the late Palaeozoic had united all southern land masses. When a major part of Gondwana subsequently subsided (by the presumed forces arising from planetary contraction), previous biological migration routes had been broken. In this way, the Süssian theory – representing vertical contraction-enforced oscillations of the crust – could explain biological similarities between continents now widely separated by oceanic barriers, for which the competing American contraction model of James Dana (1873 and 1881) offered no solution. Dana’s contraction hypothesis was strongly discrepant with that of Eduard Süss. According to Dana the overall physical state of the Earth had not changed significantly during most of its history: its internal state and surface structures were assumed to be static, including the configuration of continents and deep sea basins. The ultimate product of the American version of the contraction theory was a very slow- to-moderate episodic growth of the continents through accretion along their margins. A central theme in Dana’s model was the formation and episodic deformation of fold belts; in his view, incessant crustal contraction had produced recurrent down-warping, sedimentary accumulation, compression, and then uplift. But why were the Rocky Mountains located so far inland, and how had the intracontinental Alpine-Himalaya tectonic belt formed? With regard to the long-standing problems of the widespread marine deposits blanketing the continents, Dana suggested that the primeval oceans had been too shallow to accommodate the expelled primordial water masses, implying that the present lands, in their early history, had been submerged by epeiric seas which had then drained into the subsequently-formed deep sea basins. But this proposition did not readily fit such geological facts as that the Lower-Middle Palaeozoic marine deposits blanketed significant parts of North America, the extensive and long-lasting Tethyan Sea had been a characteristic feature across southern Eurasia for most of post-Precambrian time, and the late Cretaceous (‘Cenomanian’) transgression had apparently covered considerable parts of the continents (discussed later). It seemed, therefore, that the North American contraction-based evolutionary scheme was unable to account even for most prominent surface geological features. # The extensive periodic flooding and subsequent long-term draining of the land masses in postPrecambrian time, that left behind a blanket of shallow marine sediments, had no satisfactory explanation. # The Earth’s hydrosphere had either formed during its early history or accumulated progressively, through internal degassing and volcanic action, since the birth of the planet. But if the Earth began as a redhot molten body, as was commonly taken for granted, would it not be reasonable to think that degassed light hydrogen and hot water vapour would largely have escaped into space? Though Umbgrove proposed that the eustatic movements were a major rhythmic phenomenon throughout post-Precambrian time, the cause of these oscillating motions were referred to unspecified vertical pulsation processes in the mantle. In addition to the global cyclicity and synchronicity, it had been known, since the time of Eduard Süss that superimposed on the ‘first order’ post-Precambrian eustatic changes there were regional-scale movements of the strandline. As we have seen above, Rubey (1951) took an unconventional look at this problem suggesting that the hydrosphere had been exhaled by episodic internal processes in connection with sub-crustal thinning of continental crust thus trending towards an oceanic mode – an idea closely related to the oceanization model of Barrell (1927). However, sedimentation on the ocean floor has not been continuous; numerous Deep Sea Drilling Project (DSDP) cores show that sedimentation and erosion are typically episodic phenomena. Thus, Rona (1973) described hiatuses of up to tens of millions of years in the late Mesozoic to Middle Tertiary stratigraphic record of every principal ocean basin – expressed by intervals of non-deposition and/or erosion, which he tentatively associated with the transgression-regression cyclicity on shallow continental crust. Nevertheless, the ultimate question remains: which dynamo-tectonic mechanism stands behind the eustatic sea-level changes and the associated multitude of episodic surface geological phenomena? In view of the extremely limited information on the physical state of rocks even at shallow depths, modern studies of the Earth’s internal constitution must rely on geophysical inversion techniques, based primarily on seismological and geodetic observations, supplemented by high-temperature, high-pressure mineral physics and chemistry experiments. Nonetheless, inversion techniques have no unique solutions so inferences about the planet’s inner state and chemical constitution must necessarily be strongly modeldependent – resting on hypothetical scenarios of primordial accretion, temperature development, and mass/energy transfer processes. Therefore, to a large extent, the picture of the Earth’s interior has changed according to the needs of whatever particular theories have been/are invoked to explain surface geological phenomena. Regrettably, purely speculative ideas from time to time have become immaculate facts in all the sciences, and so it has been with regard to the interior of the Earth. For example, in recent decades deep continental drilling (Kola and KTB, S. Germany) has demonstrated that the physico-chemical constitution and structural state at even near-surface levels differ markedly from long-held conventional views – albeit without having had any noticeable effect on currently ingrained and popular views (cf. Storetvedt, 2013). Or as expressed by Wilfred Trotter (Trotter, 1941): “a little self-examination tells us pretty easily how deeply rooted in the mind is the fear of the new”. The fact that deep oceanic depressions apparently did not exist prior to the late Mesozoic and that most seawater seems to have accumulated during late Phanerozoic time suggests that both planetary outgassing and the vertical transfer of internal mass have been extremely slow – albeit markedly accelerating during the Mesozoic. The irregular CMB topography, as outlined by Morelli and Dziewonski, suggests that the core-mantle boundary zone is a thermo-chemically active and heterogeneous region. Whatever buoyant phases arise from the CMB region, the implications of the broad regions of diapiric upwelling, aided by hydrocarbons and hydrous fluids, are crustal thinning – through eclogite formation and associated gravitydriven delamination of the crust from its base upward. Hence, isostatic subsidence and development of surface depressions would ensue. Eclogitization commonly propagates along fractures and shear zones, and the metasomatic front often defines bands of eclogite trending along fractures – showing an abrupt transition from granulite to eclogite facies. Granted the availability of sufficient hydrous fluid, and with pressure conditions being satisfied, the reaction to eclogite will predictably proceed rapidly (Austrheim et al., 1996). It has been demonstrated that natural occurrences of the granulite-to-eclogite transition are strongly impeded when hydrous fluids are absent (e.g., Austrheim, 1987 and 1990; Walther, 1994; Leech, 2001; Austrheim et al., 1997). Thus, Austrheim (1998) argues that hydrous fluids are much more important than either temperature or pressure, and Leech (2001) concluded that gravity-driven sub-crustal delamination (through eclogite formation) is strongly controlled by the availability of water. According to Austrheim et al. (1997), the eclogitization process brings about material weakening which make eclogites deform more easily than their protoliths – the degree of deformability being further increased in the presence of water. Thus, the large density increase consequent upon eclogitization destabilizes the lower crust and makes it detach from the relatively unaffected crust above (Leech, 2001). Figure 4 gives an illustration of this subcrustal thinning process – advancing upward and eventually forming deep sea basins. As a consequence of the Earth’s degassing and associated internal mass reorganization, changes of its moment of inertia would be a natural consequence – producing secular changes of the globe’s rate of rotation as well as episodic, but generally progressive, changes of its spatial orientation (true polar wander). A method for studying the Earth’s spin rate (length of day, L.O.D.) for the geological past was introduced by Wells (1963 and 1970): by counting presumed growth increments in recent and fossil corals, he estimated the number of days per year back to the Lower Palaeozoic. A famous result from this study was that Middle Devonian corals gave some 400 daily growth lines per year – suggesting a pronounced slowing of the Earth’s spin rate over the past 380 million years. Subsequent studies of skeletal increments in marine fossils back to the Ordovician were generally consistent with a higher rotation rate also in the Lower Palaeozoic (Pannella et al., 1968). Creer (1975) and Whyte (1977) summarized the palaeontological length of day data available by the mid-1970. 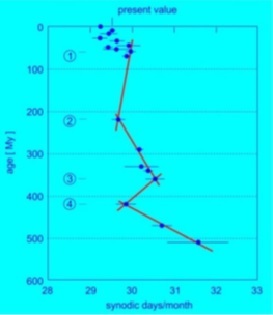 Figure 5 shows the graph of presumed number of days during postPrecambrian time given by Creer. A subsequent compilatory L.O.D. study by Williams (1989) gave closely similar results – in addition to presenting fossil clock data for the Mesozoic. More recently, a study by Rosenberg (1997) concluded that at Grenville time (some 900 million years ago) the year had 440 days. Cambrian stratigraphy is poorly known, and so are eustatic sea-level variations during that era (cf. Hallam, 1992), though a widely accepted transgression onto cratons is demonstrated by the Exxon sea level curve (see below, and Figure 7). Illuminating studies in North America (Bond et al., 1988) show consistent sealevel changes for certain specific regions: in North America, an overall eustatic rise in the Cambrian-early Ordovician is followed by a marked sea-level fall in Ordovician-Silurian time. The progressive Cambrian flooding of the cratons probably represents the first major influx of water to the Earth’s surface (as a result of degassing from the interior) – the principal factor behind the explosion of marine life at that time. 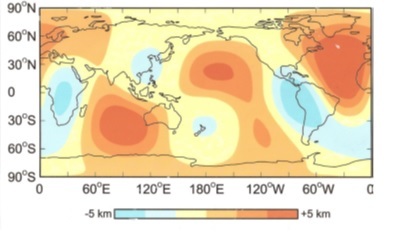 In addition, world maps of the maximum degree of shallow marine inundation (Strakhov, 1948; Termier and Termier, 1952) demonstrated a similar eustatic high sea-level during the Lower-Middle Palaeozoic. The more detailed sea-level curve of the Exxon group (Vail et al., 1977), based on onshore North American data, gave five asymmetric sea-level cycles – each representing a relatively slow transgression followed by a sharp basin deepening and a related regressive event. 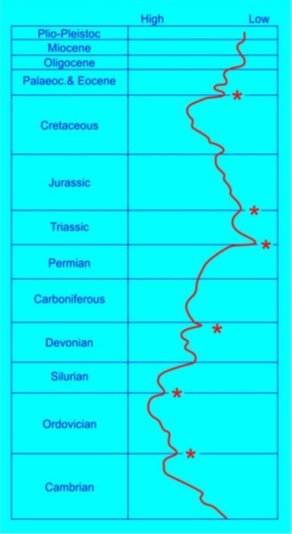 Figure 7, showing the Exxon sea-level curve for the Palaeozoic based on North American sequence stratigraphy, demonstrates an obvious oblique saw-toothshaped sea-level variation from the Silurian onwards, and an overall regression culminates in a marked Permian low-stand. In an attempt to eliminate any regional tectonic effects, Hallam (1992) proposed a generalized eustatic sea-level curve as depicted in Figure 8. For the time range concerned, the two curves are remarkably similar. Figure 7. The Palaeozoic section of the Exxon sealevel curve – after Vail et al. (1977). 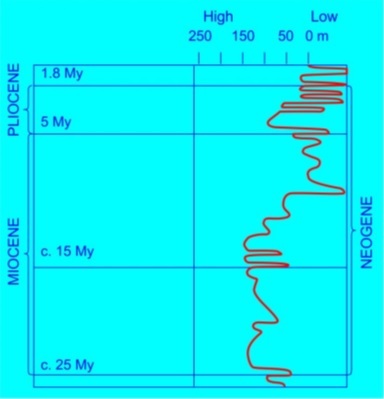 Note the sharp regressive events compared with the preceding and slower transgressive periods, and the overall progressive continental draining after Silurian time. The long-term build-up of fluids and gases in the upper mantle and lower crust can be inferred to have led to a considerable increase in the confining pressure at these levels setting off a chain of related dynamotectonic and environmental processes. Those parts of the upper mantle that received the greater amount of degassing volatiles – the oceanic regions to be – underwent long-term uplift, whereby the remaining continental blocks were affected by transgressive super-cycles along with superimposed events of higher frequency sea-level changes. In response, sub-crustal eclogitization and associated delamination caused broad regions to undergo overall progressive subsidence, while corresponding regressive events affected less attenuated (higher standing) crustal blocks. Dynamically, the episodic widespread inward loss of heavier eclogitized sub-crustal sections led to periodic planetary acceleration which, in turn, gave rise to events of inertia-driven torsion of the increasingly fragmented brittle shell. Hence, wrench tectonics processes were set in action. According to present geological and palaeomagnetic evidence, the late Proterozoic-early Cambrian equator is only exposed in two continental regions: (1) the Adelaide Geosyncline and Warburton-GeorginaBonaparte basins of Central Australia (Brown et al., 1969) – with the continent in its pre-late Cretaceous/early Tertiary orientation (see Storetvedt & Longhinos, 2014a & b; Storetvedt 2015b) and (2) the Arctic Canada-Baffin Bay-Davis Strait-Labrador Sea sector. The remaining part of the topmost Precambrian palaeoequator cuts across present-day oceanic regions (see Storetvedt, 2003 for discussion). Consistent with this palaeo-equatorial orientation, the Lower Cambrian Bradore Sandstone of northern Newfoundland and Labrador shows near-horizontal remanence inclinations – suggesting a palaeo- equatorial location (Rao & Deutsch, 1976). From a more extensive palaeomagnetic and geological database, it has been inferred that the North American craton resided at low palaeolatitudes throughout the Upper Proterozoic (e.g., Link et al., 1992; Storetvedt, 2003). Furthermore, palaeomagnetic data indicate a palaeo-equatorial setting for the late Precambrian of Australia (Embleton & Williams, 1986). The occurrence of redbeds at various horizons of the Adelaide Geosyncline and the widespread accumulation of carbonates, including stromatolitic reef sequences, provide further evidence that Australia, during the greater part of late Precambrian and Lower Palaeozoic times, experienced tropical to sub-tropical conditions. Palaeomagnetic data show that the Northern Appalachian foldbelt – of late early Lower-Middle Palaeozoic age, strikes across Newfoundland in a NE-SW direction and follows along the corresponding palaeoequatorial zone. Thus, in the Labrador Sea region, the two palaeo-equatorial zones (late Precambrian and Lower Palaeozoic, respectively) intersect each other at a fairly steep angle, signifying an important spatial resetting of the globe (an event of polar wander) in the early Palaeozoic. In the wrench tectonic system, the equivalent anti-podal palaeo-equatorial crossing corresponds to the Tasman-Adelaidean junction in the Australia region; in the pre-late Cretaceous setting of the continents, the Caledonian-Appalachian foldbelt formed a great-circle girdling the globe along which the Tasman-New England tectonic zone was located (see Storetvedt, 2003). Inferentially, the major event of polar wander in the early-middle Cambrian – resetting the palaeo-equatorial bulge and the corresponding polar flattening – must have caused a significant hydrostatic pressure increase affecting the gas- and fluid-rich upper mantle thereby triggering a number of geological processes – such as sub-crustal eclogitization and associated gravity-driven crustal loss to the upper mantle, as well as ‘beginning’ isostatic basin subsidence, surface volcanism driven by high-pressured volatiles, expulsion of a significant volume of endogenous hydrous fluids to the surface – along with gases including methane, hydrogen, helium, hydrogen sulphide, hydrogen, etc. (cf. Gold, 1999; McLaughlin-West et al., 1999; Lupton et al., 1999, and many others). According to Figure 8, marked eustatic regressions characterize principal geological time boundaries – which are thought to correspond to times of sub-crustal attenuation and isostatic basin subsidence, each event resulting in a distinct tectono-magmatic upheaval caused by changes in the Earth’s moment of inertia and thereby its rotation characteristics (Storetvedt, 1997 and 2003). The late Cambrian transgressiveregressive event was followed by subsequent sea-level rises during the Palaeozoic – culminating in regressive occurrences at the Ordovician-Silurian, Silurian-Devonian, Devonian-Carboniferous and Permian-Triassic boundaries. Thus, during the Palaeozoic, the rudimentary sea basins of the late Cambrian were deepened and laterally extended; although juvenile water from the interior was periodically added to the surface, the overall global sea-level fell ending in a marked low-stand at around the Permian-Triassic boundary. Thus, during the Palaeozoic, due to dynamo-tectonic processes, a substantial volume of seawater was added, but at the same time the capacity of the developing oceanic basins had grown so that the much less affected continental block was significantly drained. In fact, the deep regression at the PermianTriassic boundary left more dry lands than existed prior to the major influx of seawater during the Cambrian; a rudimentary outline of the modern continents had thereby been established. The six main events of marine mass extinction, corresponding to marked regressive events at principal geological time boundaries, are shown in Figure 8. The sea-level high during most of the Palaeozoic – reaching its maximum in late Ordovician and Silurian times – was punctuated by a number of regressive events. The most distinct sea-level falls occur at principal geological time boundaries corresponding in turn to events of crustal loss to the upper mantle, progressive isostatic subsidence and cumulative development of oceanic basins, as well as a range of environmental events. In this way, eustatic sea-level variations are intimately tied to the range of first-order events in the Earth’s history. By the end of the Permian, the accumulated high volatile pressures in the upper mantle had eventually been ‘exhausted’. During the Palaeozoic, the flooded land masses had been subjected to a number of distinct regressive events, each supposedly related to stages of the progressively evolving deep sea basins, but the deep late Permian regression exposed more dry land than since the Precambrian. By now the evolving oceanic basins were in a rather unfinished state, but the increasing eustatic transgression during the Mesozoic, reaching its peak in the Upper Cretaceous (Figure 9) and followed by a sharp regression at around the K/T boundary, eventually gave rise to the modern deep sea basins. During the predicted long-lasting crustal oceanization – that gradually and episodically turned the once global-extent thick continental crust into the present landdeep sea mosaic – the volume of surface water must have increased exponentially, but the capacity of the deep sea containers had clearly expanded even more so that, today, we have more dry land than since the early Cambrian. At times of major volcano-tectonic upheavals, including mass extinctions of marine fauna, the anoxic conditions discussed by Hallam and Wignall (1999), may easily have entered the seawater column. For example, some authors have suggested that the combination of massive gas-driven volcanism, associated ocean anoxic events and bursts of methane release may be responsible for three major biological catastrophes – at 250, 200, and 65 million years respectively, while Max et al. (1999) considered methane gas blow-outs as the actual source of fuel for the global firestorm recorded by soot layers at the K/T boundary. For the end of the Permian mass extinction – corresponding to a deep regression and the loss of as much as 95 % of all species on Earth, Erwin (1994) and Benton and Twitchett (2003) considered widespread volcanic activity to be the most likely cause. They concluded: “The extinction model involves global warming by 6˚C and [a] huge input of light carbon into the ocean-atmosphere system from the eruptions, but especially from gas hydrates, leading to an ever-worsening positive-feedback loop, the ‘runaway greenhouse’”. A global carbon isotope excursion behind the catastrophic die-off of terrestrial vegetation at the Permian-Triassic boundary was noted and discussed by Ward et al. (2000), and Michaelsen (2002) – studying the peat-forming plants across the northern Bowin Basin, Australia – concluded that about 95% of the plants disappeared rapidly at that time. Hesselbo et al. (2000) presented evidence that, in the early Jurassic, isotopically-light carbon dominated all the upper oceanic, biospheric and atmospheric carbon reservoirs. They suggested that the observed patterns were produced by voluminous release of methane from marine deposits of gas hydrates, which would be a natural consequence of the Earth’s internal degassing (cf. Gold, 1999; Storetvedt, 2003). A similar dissociation of oceanic methane hydrate has been suggested for the isotope excursion at the PalaeoceneEocene boundary (Dickins et al., 1995; Katz et al., 1999). Thus, throughout the post-Precambrian at least, the emission of major amounts of mantle-derived methane is liable to have raised global atmospheric temperature, notably at times of rapid eustatic excursions. The occurrence of soot in and immediately above the K/T boundary and extinction zone has been associated with a global firestorm (Wohlbach et al., 1988), an observation that Gilmour and Guenther (1988) referred to as “an incomplete combustion of methane” – a conclusion with which Max et al. (1999) also concurred. An overall regressive sea-level trend prevailed during the Lower Tertiary, but by the beginning of the Miocene this tendency was put in reverse. It may be argued that the second eustatic sea-level super-cycle of the Phanerozoic, having been initiated in the early Triassic, eventually came to a close in the late Oligocene (cf. Figure 8); it had lasted for some 220 million years and had included many minor eustatic rises and falls in combination with tectono-magmatic pulses, some of them accompanied by pronounced biological and environmental consequences. Thus, a sharp event of polar wander took place at around the EoceneOligocene boundary (ca. 35 million years ago), amounting to an angular shift of 35˚ of the equatorial bulge, bringing the Earth to approximately its present spatial orientation. Thus, for the first time in Phanerozoic history, the North Pole became positioned in the land-locked present-day Arctic Basin, and the South Pole was displaced a corresponding distance from its early Tertiary position in the South Atlantic, onto the Antarctic continent. This polar wander event marks the beginning of the well-established onset of the present Antarctica ice cap; in Europe, the major latitudinal shift is well demonstrated by palaeontological and palaeoclimatological evidence (cf. Pomerol, 1982) – associated with a drastic cooling (e.g. Buchardt, 1978). In the Atlantic region, the oscillating mid-Miocene regressions, with their related high-pressured volatilerich asthenosphere, is time-equivalent with the origin of the Columbia River basalts (dated at 16.2 ±1 My) and with the Steinheim and Ries craters in Germany (dated at ca. 15 My) – see Figure 11. Miocene and younger elevations of the deep sea crust, giving rise to continental transgression, affected broader crustal regions of the world oceans. For example, in the islands of the Central Atlantic (Cape Verde Islands, Ascension Island, Madeira and the Azores), Lower-Middle Miocene and younger marine sedimentary horizons are found at heights ranging between 400 and 500 metres above present sea level (MitchellThomé,1976), while Miocene and younger volcanic activity shows widespread distribution in this part of the Atlantic (see Storetvedt, 1985). The Neogene phases of regression are inferred to be related intimately to the youngest phases of oceanization – having transformed particular regions of continental crust into oceanic-type structures. For example, in the Mediterranean a number of isolated circular-to-oval shaped depressions formed during the Messinian – in association with a very thick succession of salt of variable chemistry degassed from the mantle. Wezel (1985), for example, argued that, in the late Miocene, the Tyrrhenian region was the site of an upstanding intra-Alpine continental crust that in Plio-Quaternary time underwent variable sub-crustal thinning and vertical collapse activated by upper mantle processes. As we have argued above, periodic vertical motions of the sea floor – reflecting build-up and subsequent release of upper mantle volatile pressures – with related sedimentary discordances and magmatic activity, are likely to have been a persistent global feature and the ultimate cause of the principal events of eustatic sea-level changes. Thus, Figure 12a delineates the significant Miocene depositional break across the South Atlantic, at latitude 30˚S, which inferentially corresponds to the Lower-Middle Miocene transgressive phase shown in Figure 11. The associated flooding of low-lying regions of South America is outlined in Figure 12b. In an extended sedimentary section at DSDP site 355 on the North Brazilian margin, sedimentary hiatuses were recorded in the topmost Cretaceous (Maastrichtian), at around the EoceneOligocene boundary, and in the Middle Miocene – supporting the thesis of a close connection between major phases of oceanic crustal uplift and erosion with corresponding events of sea-level rise on low-lying continental regions. Compilation of cored Mesozoic sediments in sites of the western and eastern margins of the Central Atlantic (Arthur, 1979; Storetvedt, 1985) again shows a significant stratigraphic hiatus consistent with the major Upper Mesozoic eustatic transgression. Acknowledgements: Yet again, I have had the invaluable editorial help of my friend Chris Argent, London, for having contributed numerous language corrections and syntax improvements of my original text. I am extremely thankful for his energetic focus on getting the paper into publishable shape. As usual, the illustrations have been made by my longtime friend and collaborator Frank Cleveland. The reviewer, Dr. Per Michaelsen, suggested a number of useful and relevant comments. Ampferer, O., 1944. Über die Möglichkeit einer Gasdruck-Tektonik. Akad. Wissensch. Wien, Math. Naturw. Klasse, Abt. Ia, Heft 1944/45, p. 45-60. Arthur, M.A., 1979. North Atlantic Cretaceous black shales: the record at site 398 and a brief comparison with other occurrences. In: Initial Reports of the Deep Sea Drilling Project, Leg 47, p. 719-752. Austrheim, H., 1987. Eclogitization of lower crustal granulites by fluid migration through shear zones. Earth Planet. Sci. Lett., v. 81, p. 221-232. Austrheim, H., 1990. The granulite-eclogite facies transition: A comparison of experimental work and a natural occurrence in the Bergen Arcs, western Norway. Lithos, v. 25, p. 163-1|69. Austrheim, H., 1998. Influence of fluid and deformation on metamorphism of deep crust crust and consequences for the geodynamics of collision zones. In: Geodynamics and Geochemistry of Ultrahigh-Pressure Rocks. Dordrecht, Kluwer Academic, p. 297-323. Austrheim, H., Erambert, M. and Boundy, T.M., 1996. Garnets recording deep crustal earthquakes. Earth Planet. Sci. Lett., v. 139, p. 223-238. Austrheim, H., Erambert, M. and Engvik, A.K., 1997. Processing of crust in the root of the Caledonian continental collision zone: the role of eclogitization. Tectonophysics, v. 273, p. 129-153. Barrell, J., 1917. Rhythms and the measurement of geologic time. Bull. Geol. Soc. Am., v. 28, p. 745-904. Barrell, J., 1927. On continental fragmentation and the geologic bearing of the Moon’s surface features. Am. J. Sci., v. 213, p. 283-314. Bayer, U. & McGhee, G.R., 1985. Evolution of marginal epicontinental basins: the role of phylogenetic and ecological factors (ammonite replacements in German Lower and Middle Jurassic). In: Sedimentary and Evolutionary Cycles. Berlin, Springer-Verlag, p. 163-220. Buchardt, B., 1978. Oxygen isotope palaeotemperatures from the Tertiary period in the North Sea area. Nature (Lond. ), v. 275, p. 121-123. Bond, G.C., Kominz, M.A. and Grotzinger, J.P., 1988. Cambro-Ordovician eustasy: Evidence from geophysical modelling of subsidence in cordilleran and Appalachian passive margins. In: New Perspectives in Basin Analysis. Berlin, Springer, p. 129-160. Bottomley, R. et al., 1997. The age of the Popigai impact event and its relation to its relation to events at the Eocene/Oligocene boundary. Nature (Lond. ), v. 388, p. 365-368. Boucot, A.J. and Johnson, J.G., 1973. Silurian Brachiopods. In: Atlas of Palaeogeography. Amsterdam, Elsevier, 426p. Bucher, W.H., 1933. The Deformation of the Earth’s Crust. New York, Princeton Univ. Press, 518p. Bridgman, P.W., 1927. The Logic of Modern Physics. New York, MacMillan, 242p. Bucher, W.H., 1933. The deformation of the Earth’s Crust. New York, Hafner, 518p. Chamberlin, T.C., 1897. A group of hypotheses bearing on climatic changes. J. Geol., v. 5, p. 653-683. Cloos, H., 1939. Hebung-Spaltung-Vulkanismus. Geol. Rundschau, v. 30, p. 405-427. Creer, K.M., 1975. On a tentative correlation between changes in the geomagnetic polarity bias and reversal frequency and the Earth’s rotation through Phanerozoic time. In: Growth Rhythms and the History of the Earth’s Rotation. London, John Wiley, 559p. Dana, J.D., 1873. On some results of the earth’s contraction from cooling, including a discussion of the origin of mountains and the nature of the earth’s interior. Am. J. Sci., 3rd series, v. 5, p. 423-443. Dott, R.H. Jr. and Batten, R.L., 1976. Evolution of the Earth. New York, McGraw-Hill, 504p. Dott, R.H. and Prothero, D.R., 1994. Evolution of the Earth. New York, McGraw-Hill, 567p. Dickins, G.R., 1995. Dissociation of oceanic methane as a cause of the carbon isotope excursion at the end of the Paleocene. Paleoceanography, v. 10, p. 965-971. Dziewonski, A.M., 1984. Mapping the lower mantle: determination of lateral heterogeneity in P velocity up to degree and order 6. J. Geophys. Res., v. 89, p. 5929-5952. Dziewonski, A.M. and Woodhouse, J.H., 1987. Global images of the Earth’s interior. Science, v. 236, p. 37-48. Embleton, B.J.J. and Williams, G.E., 1986. Low palaeolatitude of deposition for late Precambrian periglacial varvites in South Australia: implications for palaeoclimatology. Earth Planet. Sci. Lett., v. 79, p. 419-430. Erwin, H.E., 1994. The Permo-Triassic extinction. Nature (Lond. ), v. 367, p. 231-236. Forte, A.M., Dziewonski, A.M. and O’Connell, R.J., 1995. Continent-ocean chemical heterogeneity in the mantle based on seismic tomography. Science, v. 268, p. 386-388. Gilmour, I. & Guenther, F., 1988. The global Cretaceous-Tertiary fire: biomass or fossil carbon? Abstract at Snowbird II: Global Catastrophes in Earth History. Gold, T., 1979. Terrestrial sources of carbon and earthquake outgassing. J. Petrol. Geol., v. 1, p. 3-19. Gold, T., 1987. Power from the Earth: Deep Earth Gas – Energy for the Future. London, Dent & Sons, 208p. Gold, T., 1999. The Deep Hot Biosphere. New York, Springer, 235. Gottfried, R., 1990. Origin and Evolution of the Earth – Chemical and Physical Verifications. In: Critical Aspects of the Plate Tectonics Theory II. Athens (Greece), Theophrastus Publ., p. 115-140. Hallam, A., 1977. Secular changes in marine inundation of USSR and North America through the Phanerozoic. Nature, v. 269, p. 769-772. Hallam, A., 1989. The case for sea-level change as a dominant causal factor in mass extinction of marine invertebrates. Phil. Trans. Roy. Soc. Lond., B 325, p. 437-455. Hallam, A., 1992. Phanerozoic Sea-Level Changes. New York, Columbia Univ. Press, 266p. Hallam, A. and Wignall, P.G., 1999. Mass extinctions and sea-level changes. Earth-Science Reviews, v. 48, p. 217-250. Hardenbol, J. et al., 1998. Mesozoic and Cenozoic sequence chronostratigraphic framework of European basins. In: SEPM Special Publication No. 60, p. 3-13. Haq, B.U. and Shutter, S.R., 2008. A chronology of Palaeozoic sea-level changes. Science, v. 322, October 2008, p. 64-68. Haq, B.U., Hardenbol, J. & Vail, P.R., 1987. 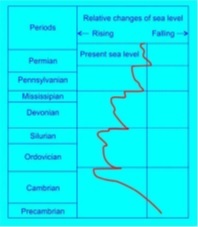 Chronology of fluctuating sea levels since the Triassic. Science, v. 235, p. 1156-1167. Hixon, H.W., 1920. Is the Earth expanding or contracting? Popular Astronomy, v. 28, p. 1-11. Hoyle, F., 1955. Frontiers in Astronomy. Melbourne, Heinemann, 360p. Hunt, C.W. et al., 1992. Expanding Geospheres. Energy and Mass Transfers from Earth’s Interior. Calgary, Polar Publishing, 421p. Jablonski, D., 1986. Causes and consequences of mass extinctions. In: Dynamics of Extinction. New York, John Wiley, p. 183-229. Joly, J., 1925. The surface history of the Earth. Oxford, Oxford, Clarendon Press, 192p. Katz, E.K, et al., 1999. The source and fate of massive carbon input during the latest Palaeocene thermal maximum. Science, v. 286, p. 1531-1533. Keller, G. et al., 1987. Global distribution of late Palaeogene hiatuses. Geology, v. 15, p. 199-203. Kreichgauer, D., 1902. Die Äquatorfrage in der Geologie. Steyl, Missionsdruckerei, 442p. Leech, M.I., 2001. Arrested orogenic development: eclogitization, delamination, and tectonic collapse. Earth Planet Sci. Lett., v. 185, p. 149-159. Link, P.K. et al., 1992. Middle and Late Proterozoic stratified rocks of western U.S. Cordillera, Colorado Plateau, and the Basin and Range Province. In: The Geology of North America, The Cordilleran Orogen. Boulder, The Geol. Soc. Am. Matthews, S.C. and Cowie, J.W., 1979. Early Cambrian transgression. J. Geol. Soc. London, v. 136, p. 133-135. Max, M.D. et al., 1999. Sea-floor methane blow-out and global firestorm at the K-T boundary. Geo-Marine Lett., v. 18, p. 285-291. Maxwell, A.E. et al., 1970. Initial Reports of the DSDP Leg 3. Washington D.C., US Govt. Print. Office. Michaelsen, P., 2002. Mass extinction of peat-forming plants and the effect of fluvial styles across the Permian-Triassic boundary, northern Bowen Basin, Australia. Palaeogeography, Palaeoclimatology, Palaeoecology, v. 179, p. 173-188. Miller, K.G. et al., 2005. The Phanerozoic Record of Global Sea-Level Change. Science, v. 310, p. 1293-1298. Mitchell-Thomé, R.C., 1976. Geology of the Middle Atlantic Islands. Berlin, Gebrüder Bornträger, 382p. Montanari, A. et al., 1993. Iridium anomalies of Late Eocene age at Massignano (Italy), and ODP Site 689B (Maud Rise, Antarctica). Palaios, v. 8, p. 420-437. Morelli, A. and Dziewonski, A.M., 1987. Topography of the core-mantle boundary and lateral homogeneity of the liquid core. Nature (London), v. 325, p. 678-683. Möller, P. et al., 1997. Paleofluids and Recent fluids in the upper continental crust: Results from German Continental Deep Drilling Program (KTB). J. Geophys. Res., v. 102, p. 18233-18254. Möller, P. et al., 2005. Main and trace elements in KTB-VB fluid: compositions and hints of its origin. Geofluids, v. 5, p. 28-41. Okuchi, T., 1997. Hydrogen partitioning into molten iron at high pressure: implications for Earth’s core. Science, v. 278, p. 1781-1784. Pannella, G., MacClintock, C. and Thompson, M.N., 1968. Palaeontological evidence of variations in the length of the month since the Late Cambrian. Science, v. 162, p. 792-796. Pinet, B.L. et al., 1987. Crustal thinning on the Aquitaine shelf, Bay of Biscay, from deep seismic data. Nature (Lond. ), v. 325, p. 513-516. Poag, C.W. and Aubry, M.-P., 1995. Upper Miocene impactites of the U.S. East Coast: Depositional origins, biostratigraphic framework, and correlations. Palaios, v. 10, p. 16-43. Poag, C.W. et al., 1994. Meteoroid mayhem in Ole Virginny: Source of the North American tectite strewn field. Geology, v. 22, p. 691-694. Pomerol, C., 1982. The Cenozoic Era. Chichester, Ellis Horwood Ltd., 272p. Rao, K.V. and Deutsch, E.R., 1976. Palaeomagnetism of the Lower Cambrian Bradore Sandstones, and the rotation of Newfoundland. Tectonophysics, v. 33, p. 337-357. Raup, D.M., 1979. Size of the Permo-Triassic bottleneck and its evolutionary implications. Science, v. 206, p. 217-218. Raup, D.M. and Sepkoski, J.J., 1982. Mass extinctions in the marine fossil record. Science, v. 215, p. 1501-1503. Rona, P.A., 1973. Worldwide unconformities in marine sediments related to eustatic changes of sea level. Nature (Lond. ), v. 244, p. 25-26. Rosenberg, G.D., 1997. How long was the day of the dinosaur? And why does it matter? In: Dinofest International: Proceedings of a Symposium Sponsored by Arizona State University. Philadelphia, The Academy of Sciences. Rubey, W.W., 1951. Geologic history of sea water. Bull. Geol. Soc. Am., v. 62, p. 1111-1148. Ruditch, E.M., 1990. World ocean without spreading. In: Critical Aspects of the Plate Tectonics Theory, vol. II. Athens, Greece, Theophrastus Publications, p. 343- 395. Schwarzbach, M., 1963. Climates of the Past. London, Van Nostrand, 340p. Sloss, L.L., 1963. Sequences in the cratonic interior of North America. Bull. Geol. Soc. Am., v. 74, p. 93-114. Smithson, S.B. et al., 2000. Seismic results at Kola and KTB deep scientific boreholes: velocities, reflections, fluids, and crustal composition. Tectonophysics, v. 329, p. 301-317. Stevenson, D.J., 1981. Models of the Earth’s core. Science, v. 214, p. 611-619. Stille, H., 1924. Grundfragen der Vergleichenden Tektonik. Berlin, Bornträger, 443p. Storetvedt, K.M., 1985. The pre-drift Central Atlantic; a model based on tectono-magmatic and sedimentological evidence. J. Geodyn., v. 2, p. 275-290. Storetvedt, K.M., 1997. Our Evolving Planet. Bergen, Alma Mater (Fagbokforlaget), 456p. Storetvedt, K.M., 2003. Global Wrench Tectonics. Bergen, Fagbokforlaget, 397p. Storetvedt, K.M., 2011. Aspects of Planetary Formation and the Precambrian Earth. NCGT, no. 59, p. 60-83. Storetvedt, K.M., 2013. Global Theories and Standard of Judgment: Knowledge versus Groundless Speculation. NCGT Journal, v. 1, p. 56-102. Storetvedt, K.M., 2015a. Mountain Ranges – A Newcomer in Earth History. NCGT Journal, v. 3, no. 3, p. 334-356. Storetvedt, K.M., 2015b. The Australia-Antarctica dynamo-tectonic relationship: Meso-Cenozoic tectonic events, and palaeoclimate. NCGT Journal, v. 3, no. 1, p. 43-62. Storetvedt, K.M. and Longhinos, B., 2014a. Australia within the setting of Global Wrench Tectonics. NCGT Journal, v. 2, no. 1, p. 66-96. Storetvedt, K.M. and Longhinos, B., 2014b. The wrench tectonic history of Greater Australia: Further substantiation of evidence. NCGT Journal, v. 2, no. 3, p. 61-69. Strakhov, N.M., 1948. Outlines of Historical Geology. Moscow, Govt. Print. Office. Süss, E., 1885-1901. Das Antlitz der Erde. 3 vols. (1885, 1888, 1901). Vienna, F. Temsky. Süss, E., 1893. 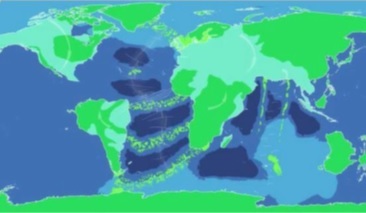 Are Great Ocean Depths Permanent? Natural Sci., v. 2, p. 180-187. Trotter, W., 1941. Collected Papers of Wilfred Trotter. Oxford, Oxford Univ. Press, 194p. Truswell, J.F. and Eriksson, K.A., 1975. Facies and laminations in the lower Proterozoic Transwaal Dolomite, South Africa. In: Growth Rhythms and the History of the Earth’s Rotation. London, John Wiley, p. 57-73. Tunyi, M. et al., 2001. Shock magnetic field and origin of the Earth and planets (extended abstract). Int. Workshop on Global Wrench Tectonics, Oslo 9-11 May, 2001. Turekian, K.K., 1977. Oceans (2nd ed.). Englewood Cliffs, Prentice-Hall, 149p. Umbgrove, J.H.F., 1939. On rhythms in the history of the Earth. Geol. Mag., v. 76, 116-129. Umbgrove, J.H.F., 1942. The Pulse of the Earth, 1st ed. The Hague, Martinus Nijhoff, 179p. Umbgrove, J.H.F., 1947. The Pulse of the Earth, 2nd ed. The Hague, Martinus Nijhof, 358p. Van Andel, T.H., 1985. New Views on an old Planet. Cambridge, Cambridge Univ. Press, 324. Walther, J.V., 1994. Fluid-rock reactions during metamorphism at mid-crustal conditions. J. Geol., v. 102, 559-570. Ward, P.D., Montgomery, D.R. & Smith, R., 2000. Altered river morphology in South Africa related to the Permian-Triassic extinction. Science, v. 289, p. 1740-1743. Webb, S.D., 1995. 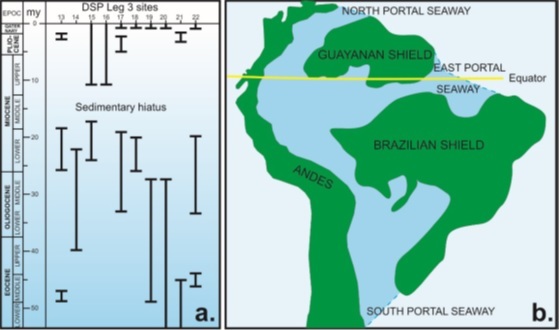 Biological implications of the Middle Miocene Amazon Seaway. Science, v. 269, p. 361-362. Wegener, A., 1912. Die Entstehung der Kontinente. Geol. Rundsch,, v. 3, p. 276-292. Wegener, A, 1915. Die Entstehung der Kontinente und Ozeane. Braunschweig, Vieweg & Sohn, 99p. Wegener, A., 1924. The Origin of Continents and Oceans. London, Methuen, 212p. Wegener, A., 1929. The Origin of Continents and Oceans (translated and reprinted 1966). London, Methuen, 246p. Wells, J.W., 1963. Coral growth and geochronometry. Nature, v. 197, p. 948-950. Wells, J.W., 1970. Problems of annual and daily growth rings in corals. In: Palaeogeophysics. London, Academic Press, p. 3-9. Wettstein, H., 1880. Die Strömungen der Festen, Flüssigen uns Gasförmigen und ihre Bedeutung für Geologie, Astronomie, Klimatologie und Meteorologie. Zürich, Wurster & Cie, 406p. Whyte, M.A., 1977. Turning points in Phanerozoic history. Nature (Lond. ), v. 267, p. 679-682. Windley, B.F., 1977. The Evolving Continents. London, John Wiley, 385p.